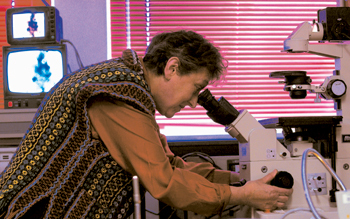 So with Karlene Schwartz (now a Boston University biology professor), she collected information from myriad colleagues to write Five Kingdoms. In the book—named by American Scientist magazine in 1999 as “One of the 100 (Or So) Books that Shaped a Century of Science”—they show that five categories of organisms are relevant as rational kingdom divisions: plants, animals, bacteria, protoctists (single-celled organisms with nuclei, such as amoebae, protozoa, and slime molds, and their multicellular descendants), and fungi. This system also provided an evolutionary perspective on the taxonomic groups, needed since Lamarck originated the theory of evolution. While Margulis and Schwartz were writing Five Kingdoms, an atmospheric chemist named James Lovelock contacted Margulis, whom he’d met through Sagan, with a question: was it possible that atmospheric methane comes from any life process? Lovelock was puzzled by the fact that methane gas is dramatically more abundant in Earth’s atmosphere—30 orders of magnitude higher—than predicted by physical and chemical forces alone. Speculating that methane and many other atmospheric gases could not have reached their current abundance in an oxygen-rich world, Lovelock theorized that such levels could not be maintained without the enormous influence of biology. Margulis believed that an important source of methane, one of the greenhouse gases that raises the planet’s atmospheric temperature, is bacteria—found, for example, in cow rumen. When bacteria break down grass during the cow’s digestive process, the methane produced as ruminant burps joins the methane from other bacterial sources (swamps, sewage sludge, animal intestines) to influence atmospheric temperature and gas. Together Lovelock and Margulis wrote an essay, “The Atmosphere as Circulatory System of the Biosphere—The Gaia Hypothesis,” which appeared in the Summer 1975 CoEvolution Quarterly. In Greek mythology Gaia was the Earth goddess, and in the Gaia hypothesis, Lovelock and Margulis argue, certain aspects of the atmosphere (temperature, composition of gases, oxidation-reduction state, and acidity) form a homeostatic system, and these properties are products of evolution. The atmosphere is a nonliving, actively regulated part of the biosphere, the total system of atmosphere, water, geology, and life on Earth. The dazzling truth that Margulis presents in Acquiring Genomes, as in her teaching video Green Animals, explains how symbiogenesis acts as a major mechanism of evolution. Subtitled “A Theory of the Origins of Species,” the book is in part a dialogue with Lamarck—who proposed that new characteristics might arise during an organism’s lifetime in response to a challenge and that, if successful, they would be passed on to offspring—and Darwin—who refined Lamarck’s theory by adding natural selection. Darwin, although doubting that any characteristics arising during a single lifetime could be passed on, was nonetheless at a loss to explain the source of innovation, the new characteristics by which emergent species vary from related species. Margulis’s theoretical work, meanwhile, argues that most life evolves by trading whole genomes, as happens routinely in the microbial world; and the mergers of whole bacteria into other cells, forming a thriving symbiosis, is the source of all larger life. Her latest paper describes a species of protoctist, Staurojoenina assimilis, with striations across its surfaces. Those distinguishing tiny zebra stripes, Margulis and her colleagues have discovered, although always found on the protist, were not originally part of its body. Rather they are rod-shaped bacteria attached to the surface in “obligate” symbiosis: you don’t find one without the other. She takes pride in the fact that her ideas are now becoming a part of the larger body of scientific thought. “Two of my four original postulates are now accepted as correct by all knowledgeable scientists,” she says, lapsing into science-speak, “that mitochondria come from oxygen-respiring alpha proteobacteria—we even know the details—and that plastids evolved from cyanobacteria. Her fourth postulate from graduate-school days is the idea that cilia and sperm tails have spirochete ancestors—corkscrew-shaped, wriggly bacteria that attached to other organisms and developed a symbiosis that functions in movement and sensation. According to this argument, the rods and cones of our eyes are descendants of light-sensitive swimming bacteria, which once had the structure of independent cells and their own complement of DNA. Once again, most scientists think that she has gone too far, and peer reviewers have refused to approve her federal research grants, cut to zero over the last two years. James di Properzio, a graduate of St John’s College, is a freelance writer and editor of scientific and literary texts. He lives in Greenfield, Massachusetts.